From the Coral Pink Sand Dunes, we headed straight to Zion National Park, just 40 minutes away. In the Spring, Zion runs a shuttle system for visitors and closes off Zion Scenic Drive to private vehicles in an effort to better manage traffic and crowds. Dogs aren't allowed on the shuttle and we realized that we missed our opportunity to do the scenic drive ourselves by a mere 5 days. (There's always next Winter!) 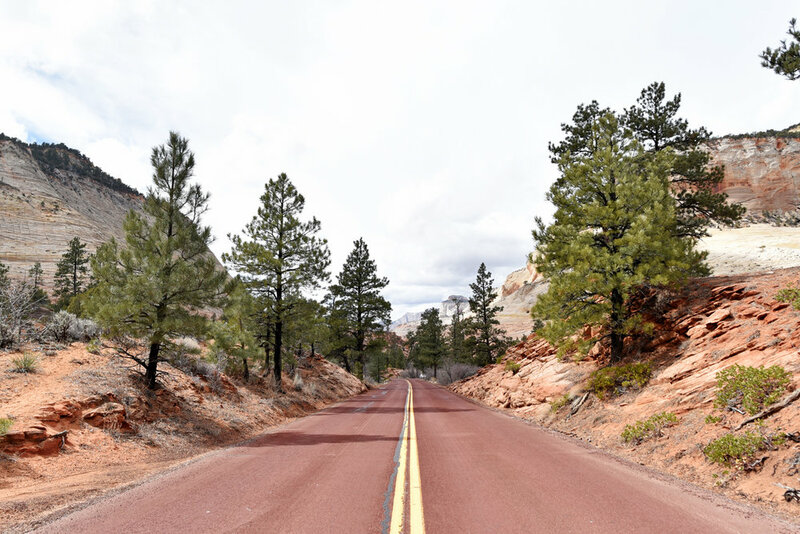 We were, however, able to drive through Zion-Mount Carmel Highway to explore the less popular east side of the park, which worked out perfectly as our route from Kanab took us straight into the park's East Entrance. 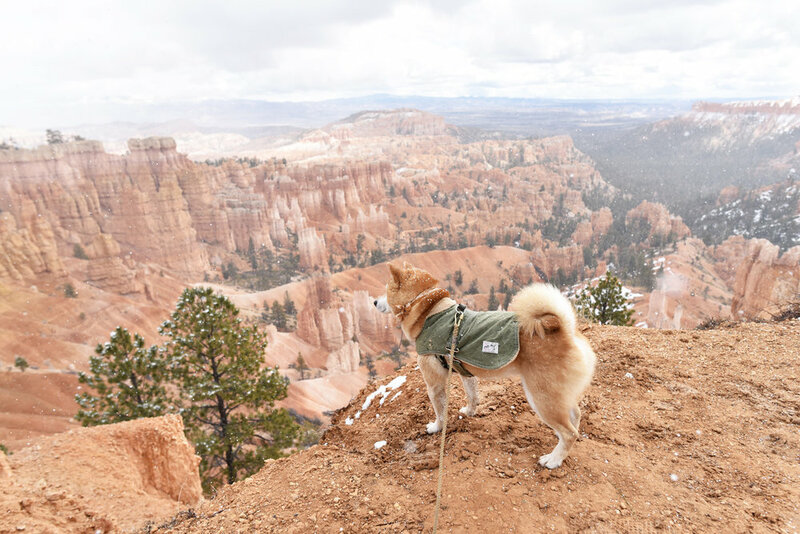 Unlike Bryce Canyon, there weren't as many opportunities to stop and let Hoku stretch his legs, but he was able to stick his face out the window and enjoy all the sights and smells from the car. One of the highlights of the drive was seeing a herd of Big Horn Sheep grazing right on the side of the road. They were much too focused on getting at the shrubbery stuck in the rocks to give a damn about the tourist paparazzi that had gathered round to watch. 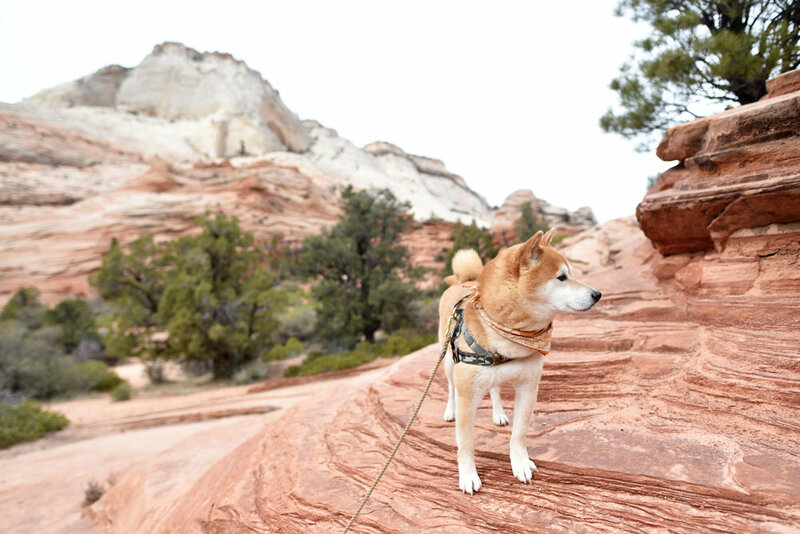 We had initially hoped to hike the one dog friendly trail in Zion called the Pa'rus Trail, but it was so difficult to find parking near the trailhead and the Visitors Center that we decided to call it a day. While Zion has probably been the most crowded and restrictive national park we've visited so far, it's not hard to see why all of its stunning, natural beauty attracts so many visitors and is worth protecting. 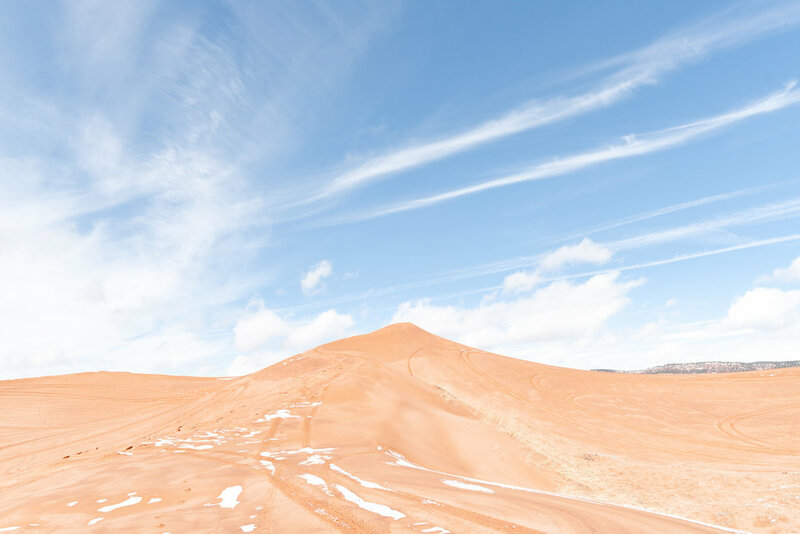 "You're in for a real treat today" the ranger told us as we paid the entrance fee to the Coral Pink Sand Dunes State Park, located just outside of Kanab. And indeed it was. 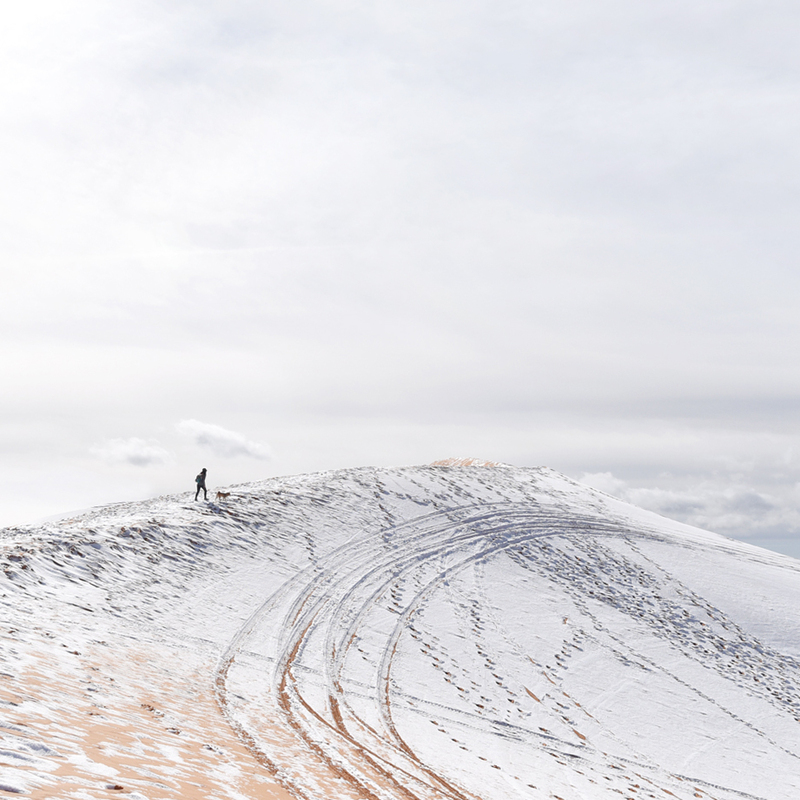 Last night's snowfall over the dunes had created a sort of strange but wonderful contrast of white snow over the park's signature bright pink-orange sand. 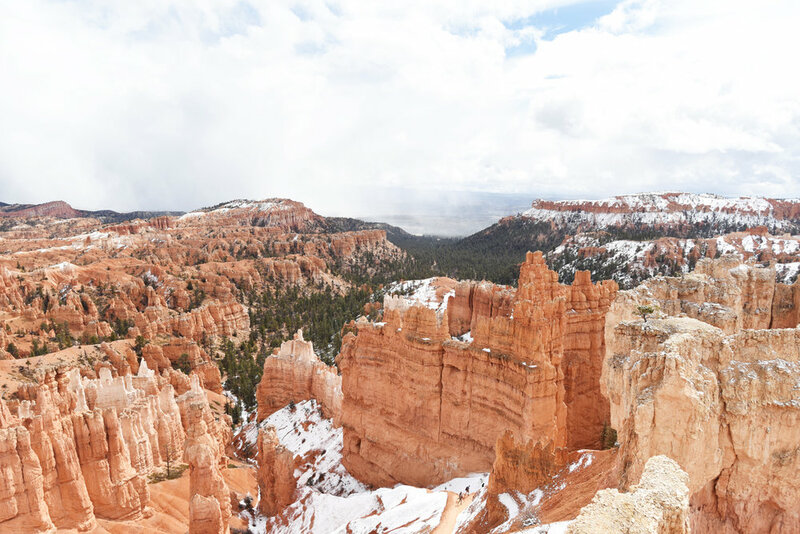 It was the third day of our Southwest road trip and while we had loved every moment of our snowy adventure to Bryce Canyon National Park, we were glad the sun had finally decided to rejoin us. There was no distinct hiking trail within the dunes as the wind constantly shifts the sand as much as 50 ft in a year. So we set off past the wooden fence, careful to watch for ATVs and headed straight up the first hill we saw. There was less snow past the fence, which gave us a better sense of just how vibrant the color of the sand really was. Sometimes the best parts of an adventure are the parts that are unplanned. The moments that are fantastically serendipitous because you just so happened to notice a small sign off the side of the road and said, sure why not? This planner is definitely learning to embrace spontaneity. The day after our White Pocket tour, the forecast in Kanab was rain. All. Day. Long. 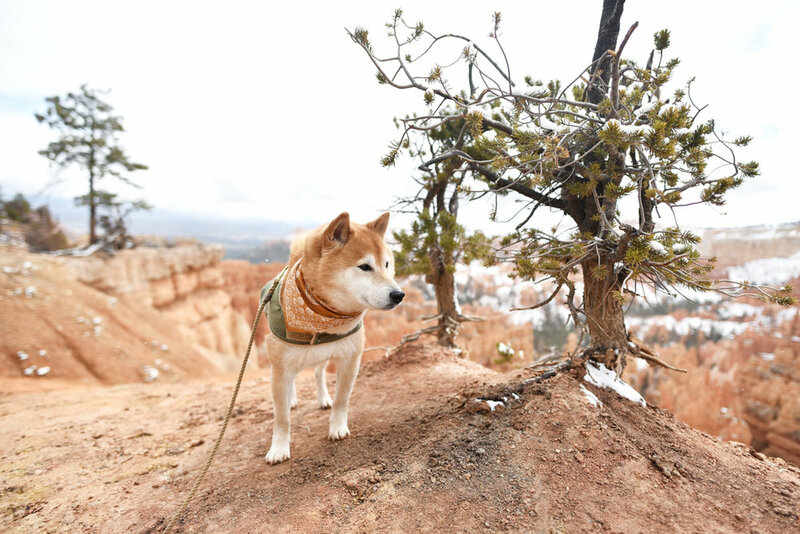 Our original plans were to hike through the slot canyons of Wire Pass and Buckskin Gulch, but were warned that the road to get there would most likely be slick and muddy. So what does one do when it rains at 5000'? Head to 8000' and play in SNOW, of course. 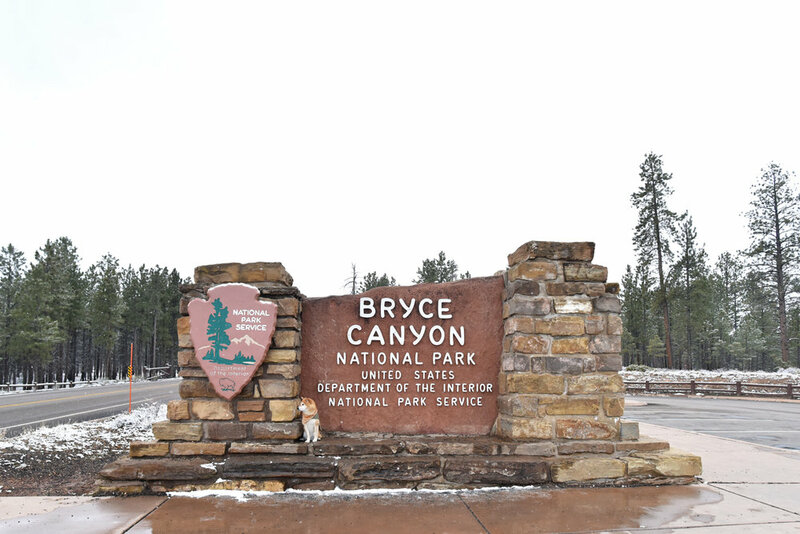 So after another unsuccessful morning at The Wave lottery, we started on the hour and a half drive from Kanab to Bryce Canyon National Park through Dixie National Forest. Along the way, we stopped in the local Dollar Family to pick up two Lunchables (the ham and cheese ones) and a can of Pringles because 1. we are still the kids who met in third grade and 2. this was vacation and diet be damned. It snowed intermittently as we walked along the rim of the amphitheater, washing out the views in a veil of white but to be honest the snow showers were my favorite part of the entire day. 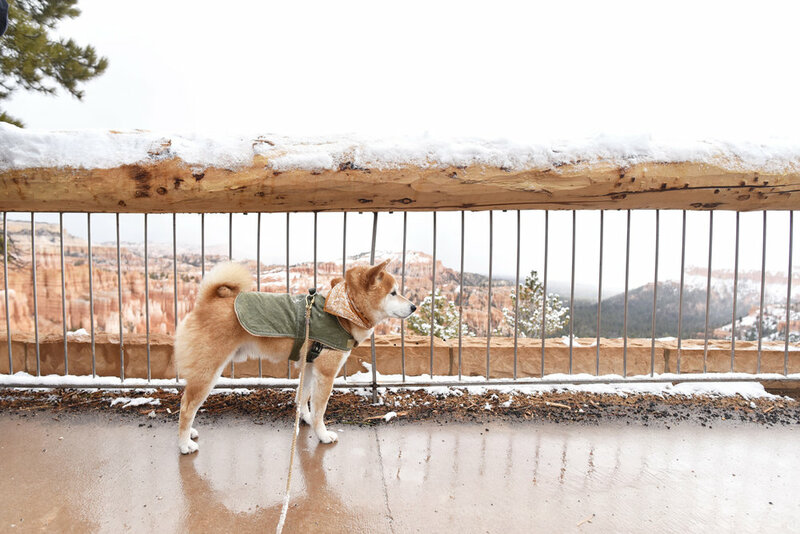 It was Hoku's first snowfall and to have it happen against the backdrop of this incredible red canyon was pure magic. 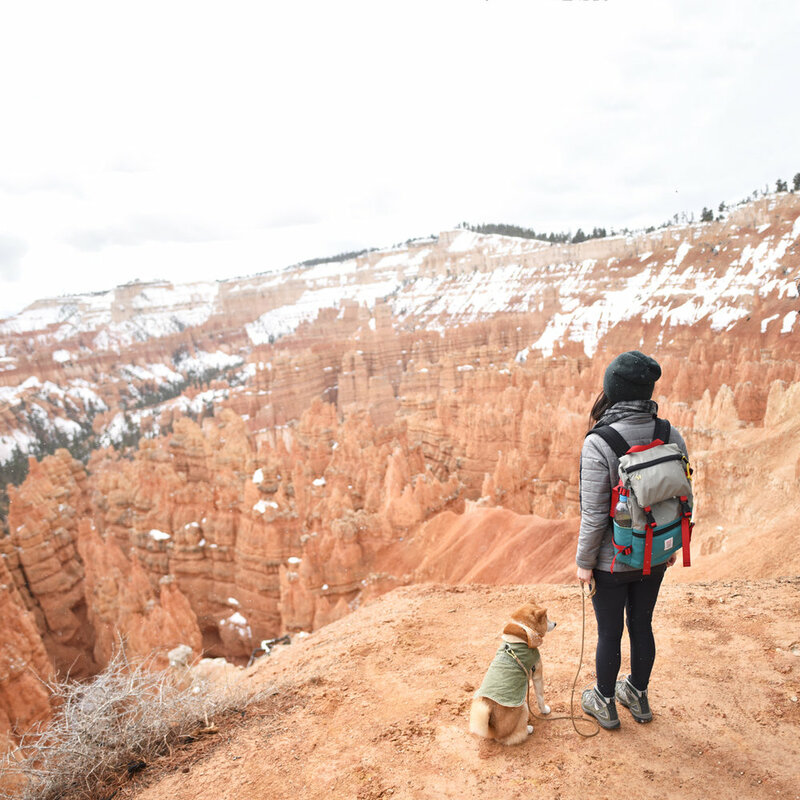 Afterwards, we started on the 20.5 mile Bryce Canyon Scenic Drive in hopes of hitting up all the dog friendly view points along the way. 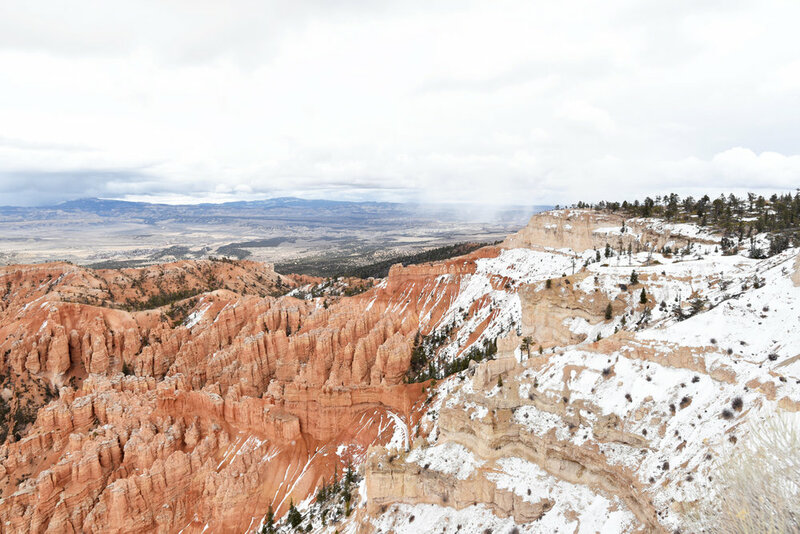 As we made our way to Rainbow Point, the highest lookout in Bryce Canyon at 9115', my secret wish for more snow came true. I didn't even mind that there was hardly a view there at all. 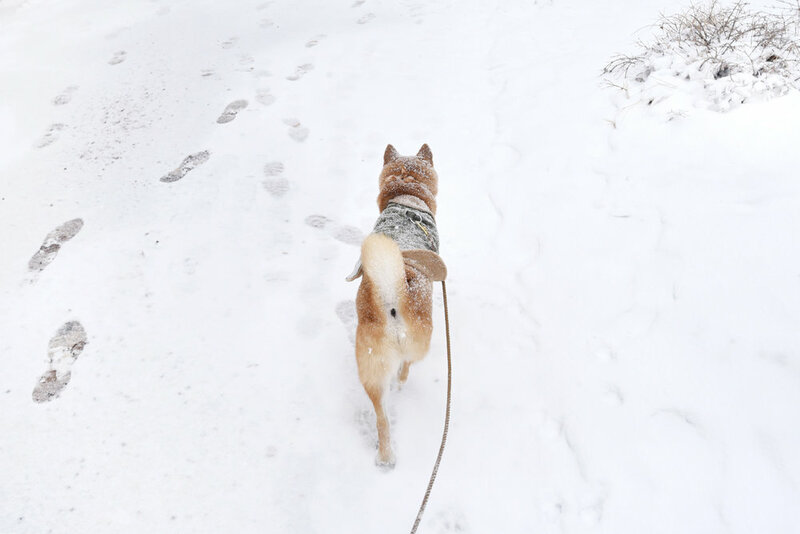 While everyone else huddled in their cars to wait it out, we gleefully ran through the flurries and played in the snow (as any level-headed Hawaiian turned Southern Californian would) until our dog turned into a four-legged popsicle. After Rainbow Point, it didn't seem like the snow would be easing up anytime soon so we decided to call it a day before the weather worsened. On the way out, we made a quick stop at the Visitor's Center to pick up some souvenirs. Hoku waited patiently for us in the car, all cozied up in his sherpa blanket while the snow continued to fall outside. 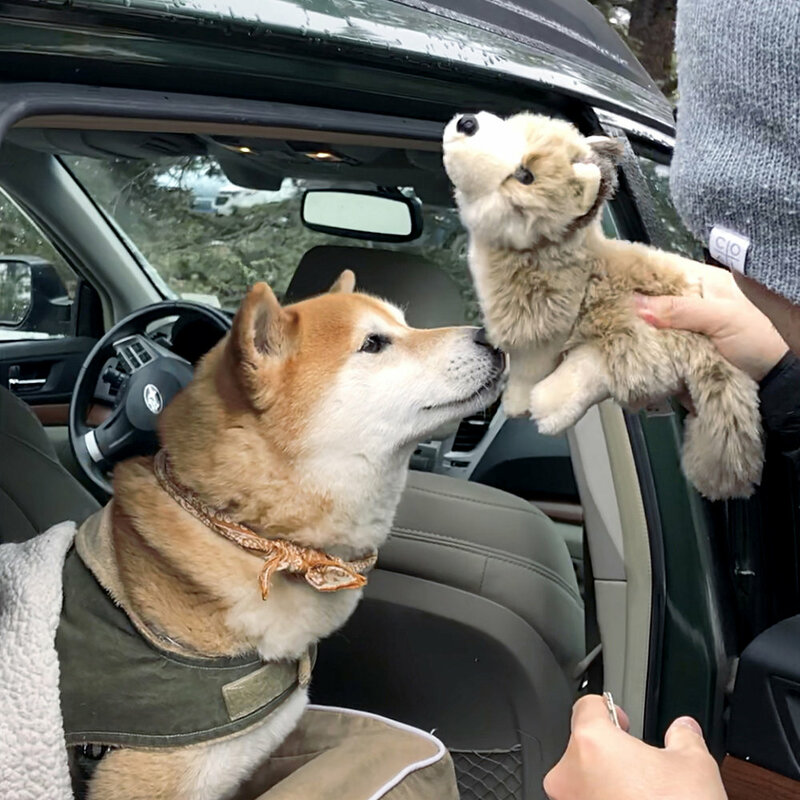 When we returned, David surprised him with a new coyote friend. We had to get a souvenir for him too, of course. It was love at first sight and they became fast travel buds as you can see from crappy phone photo below that was too cute not to share! It was a really, really good day. Snow makes everything better.